Every building needs a strong foundation for it to hold up and look good, and it's the same for your face! Without a good base, it's pretty much impossible for the rest of your makeup to go on smoothly and look good, so I feel like finding your perfect foundation is the most crucial part of my makeup routine, and yours! Here are a few of my favourites that I feel make the cut. For those if you who, like me, tend to get dry patches and want a foundation that will moisturise your skin and make it look dewy and glowing, rather than sticking to the dry patches, your best bet may be the well known and loved Rimmel Wake Me Up foundation. It has tiny shimmering particles to give your skin that glow, without looking glittery and at only £7.99, you can't really go wrong! Sometimes, especially in warmer months and places like school, you can tend to look a little more shiny, and reapplying powder ten times a day isn't too convenient. At times like this, a more mattifying foundation will be your best friend! I love the Stay Matte foundation, also by Rimmel, because it has a light whipped formula that I think goes on best with fingers to make sure it looks fresh and light. This foundation has pretty good coverage but a light feel, so it's perfect for keeping your face flawless and matte, without the need for tons of powder! 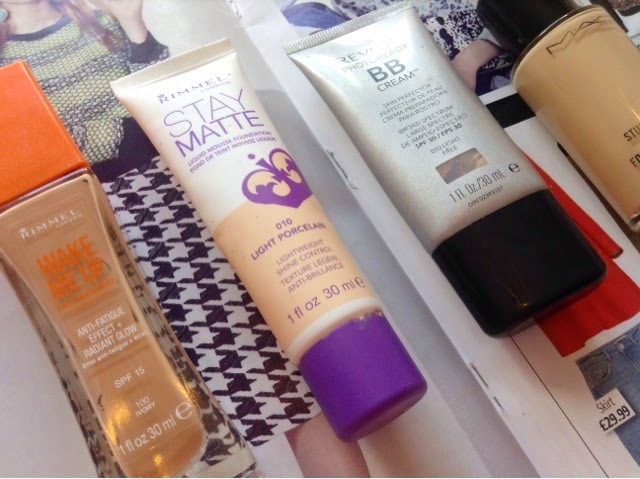 If you're just starting out with makeup or don't need much coverage at all, a BB cream could be your perfect match. After trying a fair few from Smashbox to Maybelline, my favourite is the Revlon Photoready BB Cream, which has a lovely dewy look and a light coverage, perfect for when you don't need too much makeup on but still want a little something there. Usually I prefer a lighter coverage foundation for daytime, but for nights out, performances and days when your skin just isn't looking great, sometimes you need a little help from a higher coverage base. The winner just has to be the MAC Studio Fix Fluid - it ticks all the boxes! High coverage that doesn't look cakey, a lovely satin finish and stays forever and a day on the skin, what more could a girl want? Hope I've given a little foundation-inspiration (too much?!) and finding your perfect match will be as easy as 1-2-3!